Working Without Pay A Reality For Much Of Greece's Labor Force : Parallels Nikos Aivatzidis hasn't been paid since 2012 because his employer is in a dispute with the debt-ridden government. But he's afraid that if he stops working, he'll lose decades' worth of severance pay. 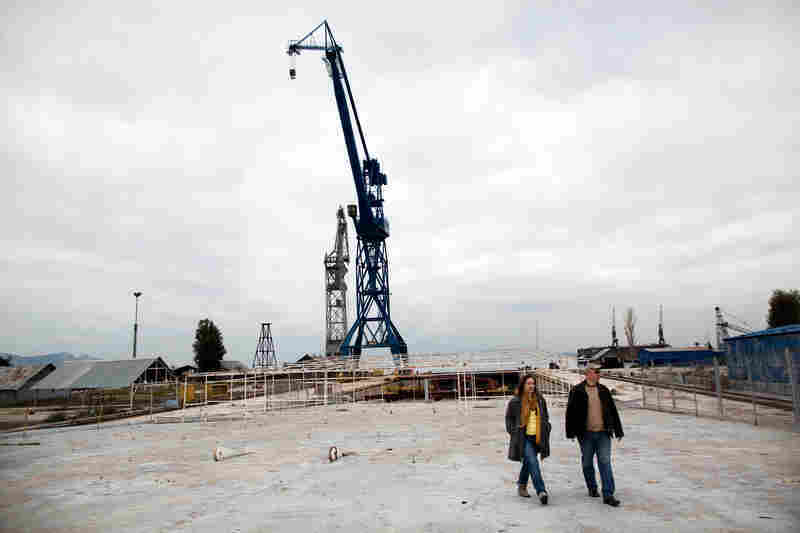 Alexandra Tsitoura (left) and Nikos Aivatzidis walk through now-empty Hellenic Shipyards in Athens, Greece. Two years ago, the shipyard employed around 1,100 workers. Alexandra and her husband Nikos have had jobs at Hellenic Shipyards for 10 and 31 years, respectively, but have not received neither a paycheck nor any form of severance for the past two years. Tsitoura visits her old workplace, where she was a secretary at Hellenic Shipyards. As Greece's economy continues to buckle under the weight of massive government debt, some Greeks are relying on their ties to family and friends to put food on the table and provide other basic necessities. Aivatzidis at his desk at Hellenic Shipyards, where he was a human resources manager. For Aivatzidis and Tsitoura, providing for their children is a communal effort. They receive help from both their parents, in particular the pension of Nikos' father, sharing meals and other expenses, and occasionally from friends who are faring better. The Hellenic Shipyards now remains empty of ships and workers. 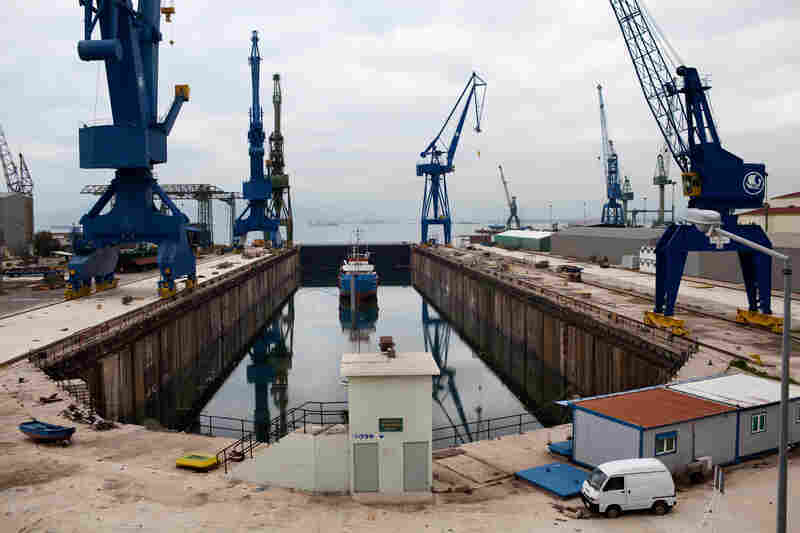 Two years ago, the shipyard stopped paying its approximately 1,100 employees. Greece's economy continues to buckle under the weight of massive government debt, with record unemployment. Some estimates put the jobless rate at 28 percent and nearly 60 percent for workers under the age of 25. Tsitoura picks wildflowers while on a visit at Hellenic Shipyards. "If I can't bring my children my wages, at least I can bring them some flowers," she said with a laugh. 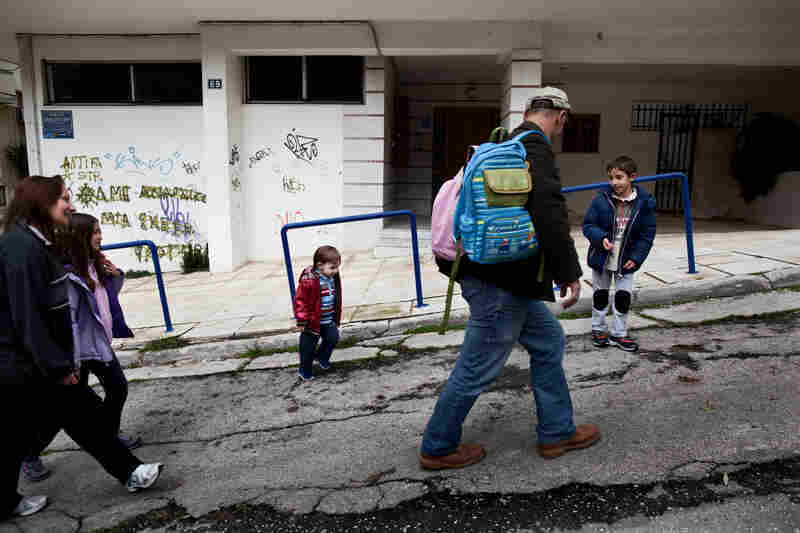 Tsitoura and Aivatzidis walk home from school with their children, Dimitris, 6, Fani, 9, and Marios, 2, in Athens. 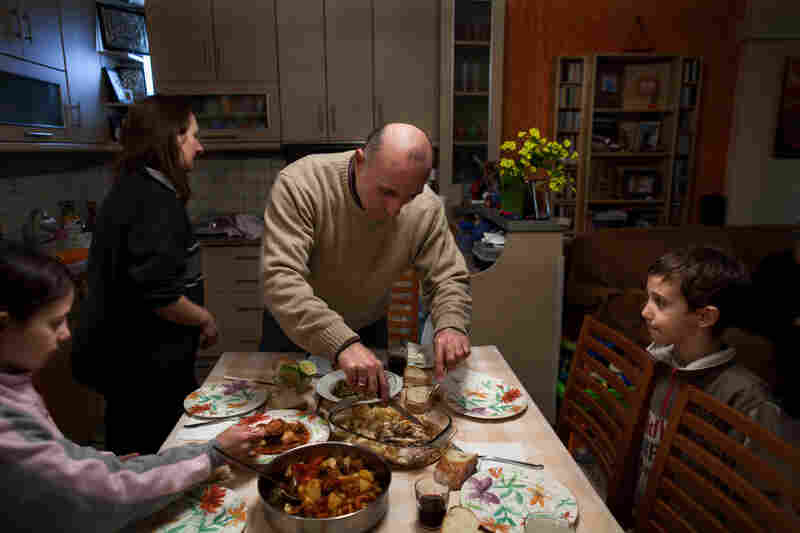 Aivatzidis cuts up leftovers before his family sits down to a meal in Athens. 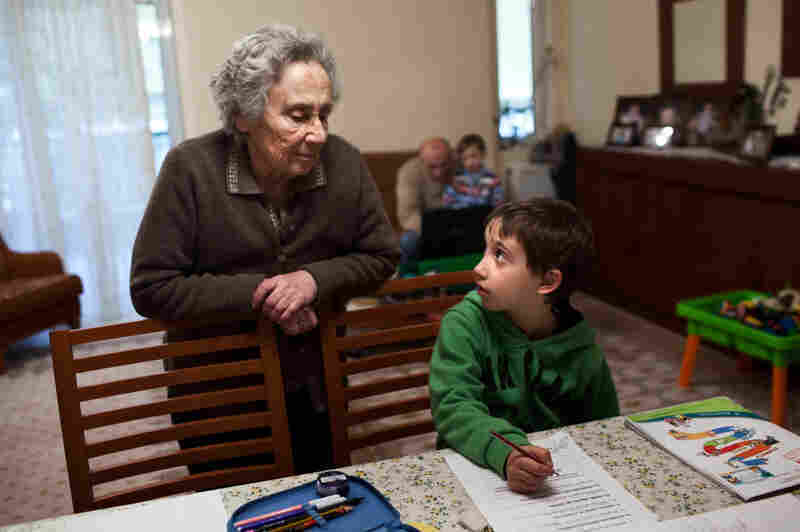 Tsitoura's mother Maria, visiting from her home in Kalamata, helps Dimitris with homework. "From an early age, the parents are saying, 'Study, study!' " Tsitoura said. "We want them [our children] to be somebody, but there are so few opportunities." Tsitoura makes sure the children are ready for bed. Her brother and their children were visiting from Kalamata, so all of the children slept together in Fani, Dimitris, and Marios' room. 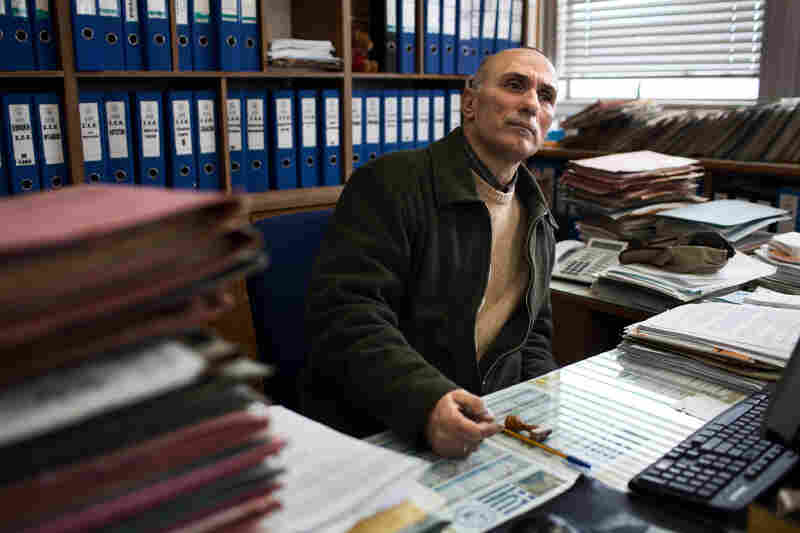 For nearly 30 years, Nikos Aivatzidis got up at the crack of dawn to drive from his home in central Athens to his human resources job at Hellenic Shipyards, near Greece's port of Piraeus. "I'd walk into the entrance and marvel as I watched [6,000] or 7,000 people heading into work with me," he says. "This place was like its own city." Now this place is deserted. Many of the roughly 1,000 workers still officially on the payroll stopped showing up after the company stopped paying them in April 2012. On a recent morning, the 51-year-old father of three and his 38-year-old wife, Alexandra Tsitoura, pull up their 9-year-old Fiat outside an empty office building. Tsitoura also works at Hellenic Shipyards. Together, she and her husband used to make around $3,000 a month. Alexandra Tsitoura and Nikos Aivatzidis with their three children, Marios, 2, (left), Fani, 9, and Dimitris, 6, in their home in Athens. As they get out of the car, they're greeted by a pack of stray dogs, looking for food. "My co-worker used to feed them," Aivatzidis says. "But she stopped coming to work." Aivatzidis keeps coming in hopes that he and his wife will eventually get paid. And he has another reason for showing up at the shipyard at least twice week. "I can't quit this job because I will lose my severance pay after 30 years of work," he says. "I can't justify that." About 20 percent of Greek workers are trapped in the same dilemma. Many, like Aivatzidis, hold on because they know finding another job at a time when the unemployment rate is 28 percent is virtually impossible. Unlike other European countries, Greece has never had a strong social safety net, so the poor have traditionally relied on family and friends. Four years into a crushing debt crisis, nearly half of the Greek labor force is either out of work or working without pay. Like many couples in Greece these days, Aivatzidis and Tsitoura have tapped out their savings since they stopped getting paychecks. 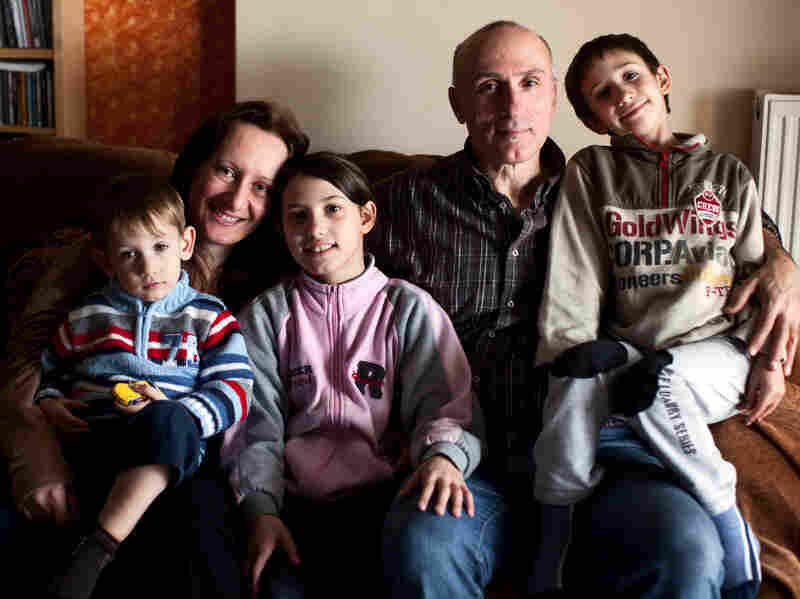 They now rely on their parents' pensions to buy groceries and pay bills. They had to stop paying their mortgage. His cellphone rings constantly, to the tune of "Johnny B" by The Hooters. "It's the collection agencies," he says, looking at the number on the screen. "I'm not going to answer it. I get agitated because they ask me questions that I can't answer, like when I am going to make a payment on mortgage." Aivatzidis is relieved that the government has extended a moratorium on foreclosures. His elderly mother, Fani, who lives next door, often shares her big pots of bean soup or pans of roasted vegetables. 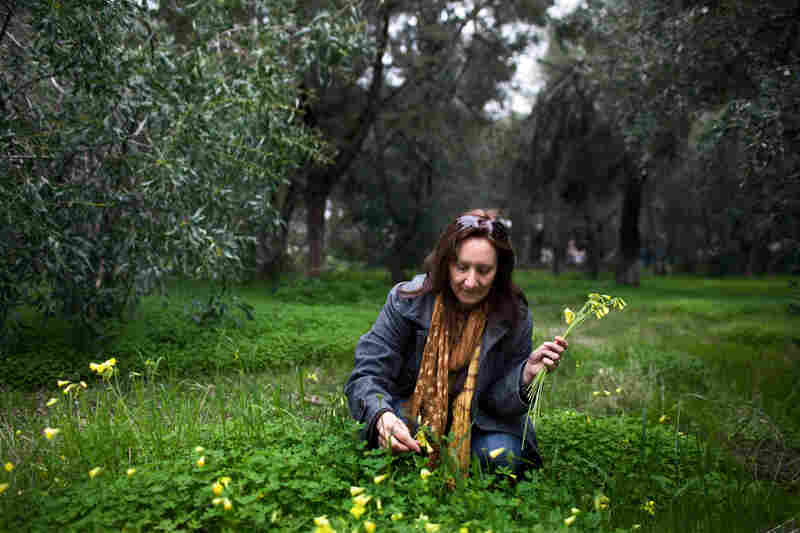 And Tsitoura's 75-year-old mother, Maria, chips in by bringing meat, olive oil and fresh eggs on her monthly visits from her home in southern Greece. Maria, a jovial woman with a bouffant of curly hair, says she is also helping her son Vassilis, who's an accountant. Most of his clients haven't paid him in two years, she says. "Every month, my husband counts out his pension on the counter," she says. "And each time, he says, 'Look, they cut out 20 euros or 40 euros.' And so every month, we have less to work with." On a recent evening, the extended family gathers in Athens for a dinner of orzo pasta, tomatoes and bread — no meat. Tsitoura likes making dinner with whatever fresh and cheap produce is in season. She washes the dishes as her children — daughter Fani and sons Dimitris and Mario — brush their teeth. "We try not to show the children that we're worried," she says. "We try to give them what they need." Their one luxury is attending free traditional dance lessons at an association of Black Sea Greeks across town. They just need gas to get there. Their troubles started when Hellenic Shipyards could no longer pay its bills. The owner, Abu Dhabi Mar, is in a contractual dispute with the debt-ridden Greek government over what the state should pay for the submarines. But Manos Matsaganis, a professor at the Athens University of Economics and Business, says the crisis has squeezed many firms in Greece. "Some of the firms have come to an accommodation with the workers, telling them, 'Look, we don't want to close, we want you to survive, and we don't want you to lose your job,' " Matsaganis says, " 'But on the other hand, we can't pay you. ... We will pay you eventually, hopefully. Would you like to keep working for no money for a while?' "
Back at the shipyard, Aivatzidis and Tsitoura stop by to see co-workers guarding the partially finished submarines that cost Greek taxpayers billions of dollars. All but one of the submarines now languish in dry dock. Panagiotis Karantzidis, a wiry, intense 44-year-old technician, spent years working on them. "I want to work so badly," he says. "My hands are strong. I am strong. I have at least 10 years of good work left in me." Aivatzidis comforts him and walks outside to the vast, empty shipyard where he has spent most of his adult life. Aivatzidis considers himself lucky; some of his co-workers are going to soup kitchens or are sitting in dark homes because their electricity has been shut off. "Maybe I still have hope and I'm patient I'll get paid because we're not yet at that point where poverty has totally taken us under," he says. He unlocks the door to his abandoned office and walks along a hallway lined with dead plants and a timecard machine that's out of order. He sits at his desk, which is piled high with binders and file folders. He has to process the paperwork of the few employees who have quit the shipyard — many to take jobs overseas.